I have a new book coming out! The Blob Blog has been on quite a lengthy break! A few special projects have kept me away. Instead of sharing Blobs today, I’m sharing exciting news! I have finally found a home for my second picture book, I Am Not Leaving Without a Hug! I’ll be working with the team at Page Street Kids to bring this project to life! And what about The Blob Blog? It’s not time for me to say goodbye…just yet. I miss my weekly posts and discovering new characters and stories. I also miss inviting and meeting Guest Artists! And I just started experimenting with time-lapse videos (Blobs #114 below)! No - not a goodbye. Just a Picture Book Make-ation. I’ll be back soon! When I’m ready, I’ll shout it out newsletter-style. So subscribe here (and scroll really far down)! With March is Reading Month coming up and story revisions in high gear, I am taking a break from the weekly blog. Please be sure to check the archive for previous activity sheets! If you are local, visit me on March 10th at the 2018 Young Authors Conference. Find more information about school visits here or contact me with questions at amy@amynielander.com. This week's Blobs were inspired by a rare yoga outing. I love to exercise (I've even taught classes!) but yoga moves at a s...l...o...w pace for me. I find it hard to be still for long periods of time. This has resulted in only a handful of yoga encounters. But last weekend, my dear spouse and I wanted to be adventurous together, so we tried a class out. MY YOGA MAT, the GIANT WINDOW we faced, an AIR DUCT that was directly above me (my eyes were not closed during back-time), THE CLEAR BLUE SKY when we walked out. A Before and After look at my initial designs (a time-lapse sketch is on Instagram). And a closer look at each transformation. I decided (and maybe my yoga experience influenced my decision) that my character would be strong and flexible. Introducing - Strong Bug (otherwise known as Poly). Thanks for stopping by! And if you came up with characters on your own, let me know! I'd love to see them. Share designs using #theblobblog. Ready to create some characters? Download Blobs #115 here! Check back Friday for my results. Inspiration is posted on Instagram. We are celebrating MLK Day at our local school today! Please stop by next week for Blobs #115. Below are a few links for kids to learn about Martin Luther King along with fun craft actitivities! COIN TRAY with all of my quarters (I needed about $7 in change), a DRYER and a decorative SHELF STAND that was directly behind me. ANTS READING the cookie packaging list of ingredients section while sitting on top of crumbs. I hope you enjoyed this weeks characters! Thanks for stopping by! Happy New Year! Find our very first batch of blobs for 2018! What characters do you see? Download Blobs #114 here to and find out where they came from on Instagram. Welcome to Results Day! If you're dropping by for the first time this week, we've been celebrating the work of Author Illustrator Debbie Ridpath Ohi each day on Twitter and Facebook. She has illustrated many picture books including NAKED! , I'M BORED and the upcoming I'M SAD (June 2018) by Michael Ian Black, as well as written and illustrated WHERE ARE MY BOOKS? and the latest SAM & EVA. I hope you enjoyed sneak peeks, interviews and learning more about her creative process. I have never met Debbie before. I first discovered her months ago on Twitter. I can’t remember what post led me to her but I do remember quickly becoming a "follower". Her world was brewing with fun, kindness and loads of creativity. She reached out to everyone. Teachers, readers, illustrators, authors, parents, publishers, librarians. I loved her openness and ease. I looked forward to seeing posts filled with pick-me-up cartoons, encouragement, kidlit events and then...food doodles. It was then I strummed up enough courage to reach out to her and ask if she would like to be a Guest Artist on the blog. I really (really!) wanted to see how blobs worked for her and what characters she could create. ...a wintry, evening stroll downtown Royal Oak where every block beamed with light. 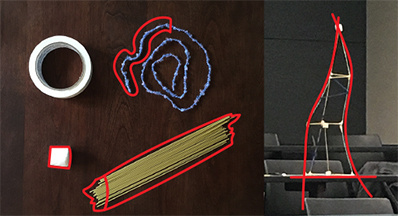 Each shape I picked came from that light-scape, except when we were indoors having dinner. Can you spot that moment? This mixed collection makes for one colorful party of characters! Who was your favorite book character as a child and why? Douglas Spaulding in DANDELION WINE, because I loved how he thought about things….so many truths, and that made me think more deeply about similar topics. I was also inspired by how he saw beyond the surface of things and people. Which character in your books was the most fun bringing to life and why? The Potato in I’M BORED, without a question. I loved how crabby he was in the first book. In I’M SAD, the sequel that comes out from Simon & Schuster in 2018, the Potato is crabby but also hilarious. And I was delighted to recently find out that Michael’s working on a third in the series that I’ll be illustrating: I’M WORRIED. Where do you find the most inspiration for your characters? That’s a tough question! It depends on the character and the story. For the little boy named Spencer in WHERE ARE MY BOOKS?, for example, I was inspired by my nephew, Spencer — he loved to read books when he was little. Which BLOB inspired you the most and why? All of your wonderful blobs inspired me! I think the one I eventually turned into Little Red Riding Hood was the most challenging, so I found it the most inspiring since I had to work harder at coming up with something I wanted to draw. Thank you Debbie for generously donating your time and creating characters this week! Happy Holidays to everyone and check back on January 8th, 2018 for Blobs #114! The Blob Blog is topping 2017 off with a Guest Artist this week! I am so excited to welcome the mega creative Author Illustrator Debbie Ridpath Ohi today. You'll get to know her everyday this week on Twitter and Facebook where I'll be sharing video clips, sneak peaks, interviews and more. Her character designs + an interview will be posted on Friday. If you want to create along with Debbie, download an activity sheet here and use #theblobblog to share. Join me on Instagram to peek at my weekend inspiration! It has been a snowy week here! Our first big snowfall hit us this weekend and snowy conditions helped me come up with Blobs #112! ...so they can turn into Blobs #112. After cleaning them up I created my Activity sheet. Here is a quick look at Before and After rough designs. FRANK'S SNOWWORM WITH HORNS is a little unexpected. Next week will be my last post before the holiday break and we have a super special Guest Artist stopping by! Please check in on Monday to find out who it is...! Create new characters with this week's batch of Blobs #112! 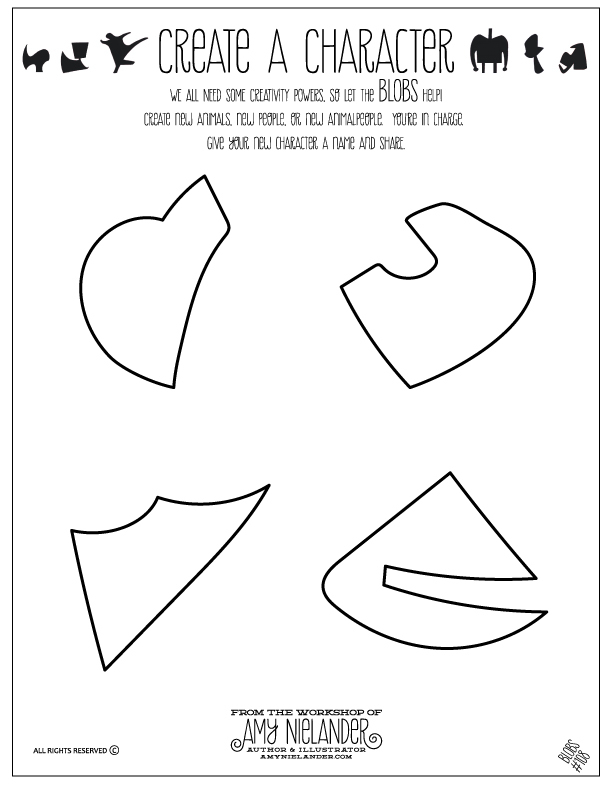 Download an activity sheet here. Posting my inspiration for the week on Instagram. Welcome to RESULTS DAY! If you did any character creating this week, share your designs using #theblobblog! I would love to see what you imagined! We went to two different tree stands to find the right tree for our home. As we searched I found a STONE TILE, a wreath with a PINE CONE and some exciting PEA GRAVEL. After we came back, I noticed the bright sun casting all kinds of SHADOWS on our wall (can you tell what kind of windows we have?). ...and after I created my Activity sheet, I did some sketching! Character creating usually happens late Thursday night for me. But today I was able to spend a few minutes doing initial character sketches earlier. I ended up using my eraser quite a bit - oh no! I was stuck after only a few seconds into creating characters! I started with the bumpy pine-cone inspired Blob first. I was going to turn it into a pet, but I couldn't quite figure out what kind of pet. Maybe an IT pet? I decided to keep trying and a reptilian creature started to appear...then an iguana popped from my page. From what I could remember, they had a flappy spine of some sort. After playing around more, I added some holiday spirit. What if someone was getting an Iguana for Christmas? That sounded fun to me so I did more digging and finished that character sketch. I moved onto my first shape and stuck with the holiday theme. Below are all of my transformations. There's not much here though! Most of my time was spent tweaking my character to make it look like she was giving her new pet a hug. I wanted IGGY's scales to look like they were pressing (gently) into her cheek and went through many, many, many versions. our cute pooch (with half the amount of hair he woke up with)! Instead of doggy paw prints I used deer tracks on my deer's bandana. I love when real life inspires character details. It makes new characters more believable. And that's it for characters this week! I hope you had fun coming up with designs and maybe even imagining a story. Thanks for stopping by and check back on Monday for a new batch of Blobs! Design new characters with this week's batch of Blobs! Download a sheet here. Find my inspiration on Instagram. Rolling out dough for yummy pumpkin pie, spiky looking flower, shimmery leaf bouquet filler, and a familiar ceramic sugar pot with cap. Since I couldn't come up with a character quick enough for this shape, I turned him in to a purebred Blob (one who belongs to no particular species...except Blobs). Since spoons were on my mind from the previous design I decided to give this Blob a breakfast dish he would somersault out of bed for...cereal! He looks like he might be friends with the HUNGRY HALLOWEEN Blobs! Thanks for stopping by and be sure to check in Monday for Blobs #111. 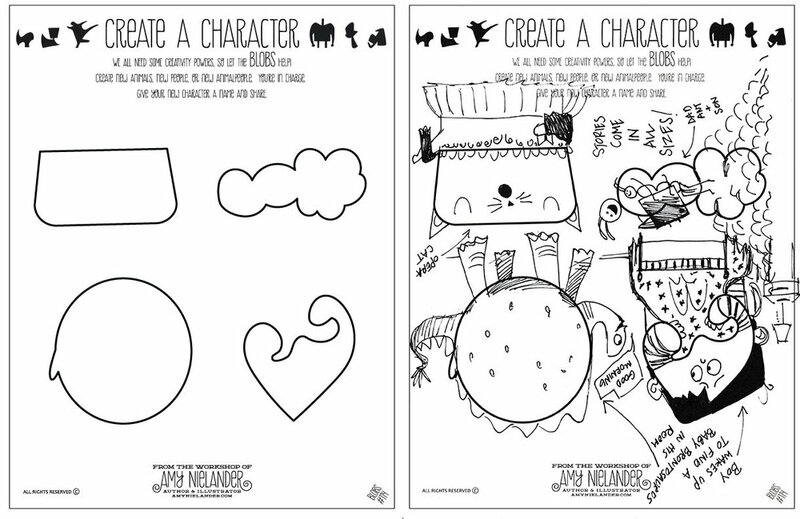 Create your very own characters with this week's batch of Blobs! Download a sheet here. Find clues to my inspiration on Instagram. Welcome to Results Day! I hope you had fun coming up with characters this week. My inspiration for Batch #109 came from a Scout Engineering Day we attended this past weekend. It was hosted by the Society of Women Engineers at University of Michigan in Ann Arbor. The day was packed with activities and speakers for both parents and girls! We kicked off the workshop with the funnest challenge I've seen for kids. I highly recommend it for classroom icebreakers or rainy days. The best part is the limited number of supplies needed! It was called the Marshmallow Challenge. 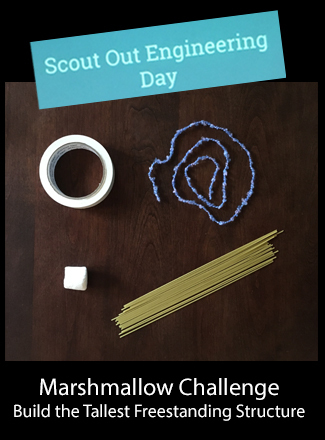 One yard of tape, One yard of string, One marshmallow and 20 spaghetti noodles. Our structure ended up being 27" tall! All possible because of teamwork! Dog does not seem happy about his Birthday...! I wonder why? What do you think Thorn Bug wants for his birthday? Rat gets his favorite snack on his Birthday! Rat is a little loose. I really did not want to google RATS for reference. So, I guessed on their hands and feet! And that is it. What did YOU come up with? If you feel like sharing, post designs using #theblobblog on Twitter, Facebook or Instagram so others can see all the amazing characters brought to life this week! Blobs #110 will be posted November 27th. Happy Thanksgiving! Create characters with a new batch of Blobs here! Sharing my inspiration for the week on Instagram. I can't wait to talk about this fun challenge! We love cozy fires! This is the wood pile in our backyard. I didn't need to go too far to find a batch of Blobs for this week. I picked shapes that were interesting to me and turned them in to Blobs #108. I had a hard time coming up with characters quickly this week! I had to step away and come back again when I got stuck. I could not get my exact blobs to work, so ended up modifying them a bit to make me happy! This was my favorite character. Who doesn't like laughing!? It's always fun being surrounded by cheerful friends or family, so I turned my blob in to a pig who loves making his friends smile. Can you spot the transformation from my initial design to the color sketch? My character went from human to...GUINEA PIG! Why? We love guinea pigs! We have had three pet GPs in our home. Since my initial blob was very blocky I decided to try a simplified creature shape and chose, the adorable guinea pig. Researching various guinea pigs almost got me off track though! Especially when I came across guinea pigs in costumes. Ants were still on my mind after blob 1, and led me to creating ANT COASTER. I did brief research on coaster structures and came across these paper roller coasters! This was probably the hardest character to create! WALRUS strayed away from the original design, but the tusk-like shape and squared off corner inspired this guy. He is my least favorite aesthetically because his body still needs work as well as the checkerboard. BUT, this is a creativity exercise and I'm not getting too caught up for now. The important takeaway is the concept. Especially if it leads me to developing a story. That is when WALRUS would get fine-tuned and I'd develop more character studies. For now, I like the thought of an adorable, sweet walrus always wanting to play the same game with his friends. Who could possibly turn him down? Thanks for stopping by! Check back in on Monday for a new batch of Blobs! Create characters with a new batch of Blobs here! Sharing my inspiration for the week on Instagram (can you spot the Blobs?). 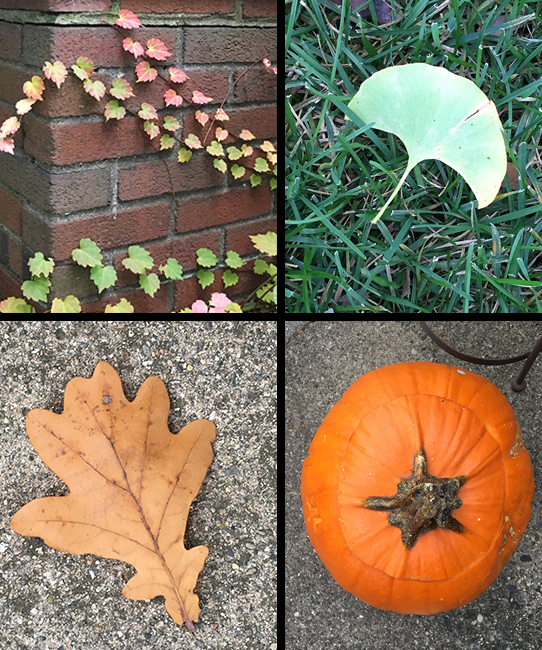 Ivy, a Ginkgo leaf, an Oak leaf, and the top view of one of our Halloween pumpkins. ...created my sheet, then sketched out some characters! A dog dressed up as a lion for Halloween and a little zebra wanting a treat. And that is it - quick character and color studies! I had fun with these shapes and hope you enjoyed seeing the design process. Check back on Monday for a new batch!